When Barnes and Noble first unveiled the Nook HD and Nook HD+ back in September, I was intrigued by the unique screen size of the 9-inch Nook HD+. But ultimately I decided to get a 7-inch Nook HD because I’ve been reviewing a lot of 7-inch tablets lately like the Kindle Fire HD and Google Nexus 7 and thought it would be a better choice for comparison reasons. But then Hurricane Sandy came along and ruined B&N’s launch plans so I ended up finding a Nook HD+ at a local B&N store a week before my pre-ordered Nook HD even shipped. And now I’m glad I ended up with the larger model. Here’s the link to my Nook HD+ review for the full rundown. I also plan on posting some rooting guides and tutorials in the coming weeks because I really want to get Google apps and the Google Play store onto my HD+. So stay tuned for more Nook goodies! Great review. They are on sale for Black Friday this week, great time to get one. Oh I forgot to mention I am currently using the Coby MID7142 (i think that’s right) and its a pretty good ereader. Google Now is the closest thing to a Siri-like app. It might work if there’s ever a Jelly Bean ROM for the Nook HD+ (I hope so). Quick question for you: when you create a “Shelf” on the Nook HD+, does it disappear soon after you add content to it? Every time I click “My Shelf” and “create new shelf,” the eBooks I add and the shelf itself completely vanishes. It has done this every time I have tried to create one. I have also had issues with side-loaded books getting scrambled by the Reader app. Text displays as if it were covered in wax paper, all blurry and distorted. Weird. I never really use shelves much because I mostly use the search bar to find stuff quickly, but I’ll give it a shot and see what happens. Last night it took me forever to figure out how to remove profiles :). Long story short you have to be in the main profile to get the option to delete. A shelf I created today has remained. We will see if it holds until tomorrow. Other than the massive amount of technical glitches I seem to be having, I really love the HD+. The N2A card couldn’t come soon enough though. I just checked and my two created shelves are still there this morning. You seem to have an unusually buggy Nook HD+ for some reason… And yeah, I can’t wait to get a custom ROM on this thing. That will be sweet. It seems I am not the only one with the disappearing shelves problem. I found a number of posts on Mobile read by NST users who had the same issue with their devices. A new update was just released that is supposed to fix this. 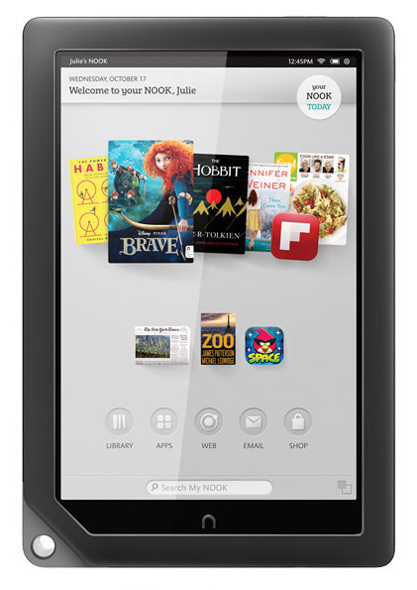 Also, there is an update for the Nook HD+. I just installed it this afternoon. Hopefully it will resolve some of the glitchy issues I have been having. One thing I noticed already was that there is an auto-form fill option, and the letter ‘i’ is now auto-capsed, along with the first letter after a period. That is nice as typing on the HD+ was very laborious. I am still missing Android autocorrect and spell check. Ooo I just found that I needed to turn on spell check. That problem is solved, but I still need full autocorrect. Nook auto only corrects basic words. My tablet also briefly acted as though it was possessed after the update. Random letters were being typed and recent apps opened. Glad to see that double space period is now working too. – Much more importantly, frequent frame drops during HD video playback, even when fed just 720P files (which I own, and have transcoded myself) that play just fine on the iPhone 5, iPad 2 and iPad Mini). – Furthermore, similar to the problems noted above, the device literally loses some movies placed on the microSD card, though they can still be seen (and copied back and played just fine) by a computer via USB. These are files which are properly placed in \Computer\BNTV600\SD Card\My Files\Videos. – I’ve also had three lockups in just a few days of using the device, including after the software upgrade. Followed up now (after the update, or just by chance) with playback sometimes just halting halfway through a movie, and you’ll then receive a popup message saying something along the lines of “Sorry, cannot play the video at this time”. These are just standard MP4 (w/H.264 and stereo audio) files, which play on everything else I can get my hands on. The microSD cards I use are SanDisk Class 10 (specifically recommended for Android devices), meaning that they’re about 40X faster than needed for this playback. There’s much work to be done here. Mark, I agree. The bugs I experience during even the most simple tasks are driving me crazy. Just reading ebooks can be a tiring proposition with all of the glitches and crashes. I really love the display, but I can’t take it anymore. I just ordered a Nexus 10. I’m never leaving stock Android again lol. By the way, the disappearing shelves issue hasn’t been fixed for the HD+. Once again, all my shelves are gone. This has happened every single time I create a shelf, both with side-loaded and B&N content.